This is our gratitude pumpkin, a tradition I started with my children a few years ago. Each day in November, we we take turns writing what we are thankful for. 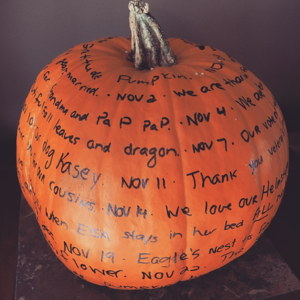 On Thanksgiving, the gratitude pumpkin is displayed on our dinner table, and we read each entry. By doing this, I’m hoping to instill the thought that we have so much to be thankful for while demonstrating how blessed we truly are. Our gratitude pumpkin reminds me how important it is to express gratefulness. I try to teach my kids the three guidelines of expressing gratitude, but they can just as easily relate to many aspects of life — including donor care. Feel it. Be thankful and mean it. When you are truly grateful, you come across as genuine — and people recognize and appreciate sincerity. Say it. Either in person, on the phone, or via email, just saying “thank you” is important. One of the best ways to let your donors know your heartfelt appreciation is by telling them. Show it. Your actions matter and won’t go unnoticed when you invite a donor on a tour to see the programs they have helped fund, or when you share a meal with them at an appreciation dinner for supporters. Recently, an email was shared with me that is the perfect example of graciousness in action. After a farewell dinner for Major Deborah Sedlar, former Divisional Commander of the Western Pennsylvania Division, a new advisory board member — Emily Brant — wrote an email to others attending the event, expressing her thankfulness for The Salvation Army. Though she didn’t have a chance to meet everyone in person, she wanted to introduce herself and extend a sincere “thank you.” She goes on to say that while her family was always just moments away from needing help, she remembers volunteering in her youth in rural Somerset County winterizing homes. She looks back on that time, recounting how many of her neighbors were not only devoid of a television, but indoor plumbing as well. Since these days long ago, Dr. Brant remains active in the Somerset Service Center, and has pursued a career in medicine — recently completing her residency in emergency medicine. She talked about how she’s blessed beyond compare, and how her experience growing up in The Salvation Army has provided a helpful perspective when caring for the most vulnerable people in her line of work. She plans to continue giving back, focusing on the Pathway of Hope and Feeding Families for Life initiatives. During the busy upcoming holiday season, let’s use this note as a reminder to fill our hearts with gratitude, and to express it to all those who help and support the same amazing mission.